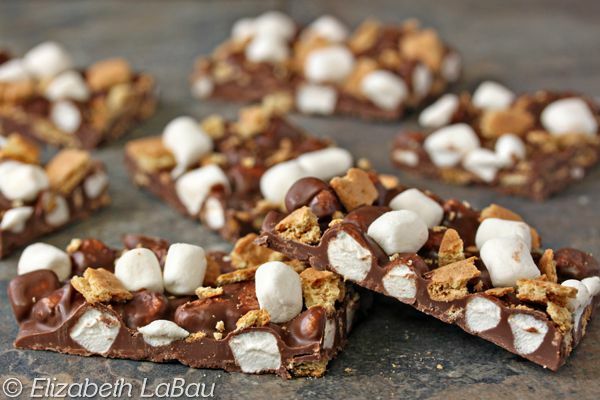 S'mores bark is an easy chocolate bark made with milk chocolate, miniature marshmallows, and graham crackers. This crunchy, chewy treat has all the flavor of your favorite s'mores, with no campfire required! Prepare a baking sheet by lining it with aluminum foil. Toss the coarsely chopped graham crackers and the miniature marshmallows together in a small bowl. Place the milk chocolate candy coating or chopped milk chocolate in a large microwave-safe bowl. Microwave it until melted, stirring after every 30 seconds to prevent overheating. Stir until the chocolate is fluid and free of lumps. Allow the chocolate to cool slightly until it is still warm but no longer piping hot. Add about two-thirds of the graham crackers and miniature marshmallows mixture to the melted chocolate, and stir until combined. Scrape the chocolate mixture onto the prepared baking sheet, and smooth it into a thin, even layer. Sprinkle the remaining graham cracker chunks and marshmallows evenly on top, and press them gently into the chocolate to make them adhere to the surface. Refrigerate the bark until the chocolate is set, for about 30 minutes. Once the chocolate is firm, break it into small, irregular pieces to serve. Store s’mores bark in an airtight container in the refrigerator for up to a week.